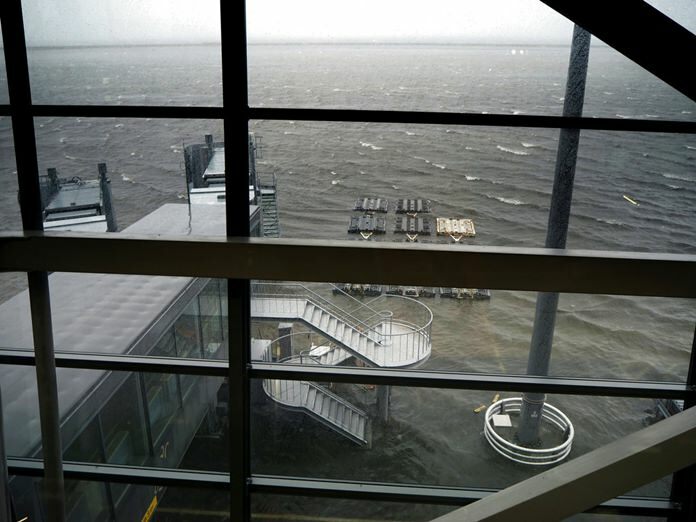 Tokyo (AP) — A powerful typhoon slammed into western Japan on Tuesday, causing heavy rain to flood the region’s main international airport and strong winds to blow a tanker into a bridge, disrupting land and air travel and leaving thousands stranded. The storm left at least nine people dead. Jebi, reportedly the strongest typhoon to make landfall in Japan since 1993, headed north across the main island of Honshu toward the Sea of Japan. 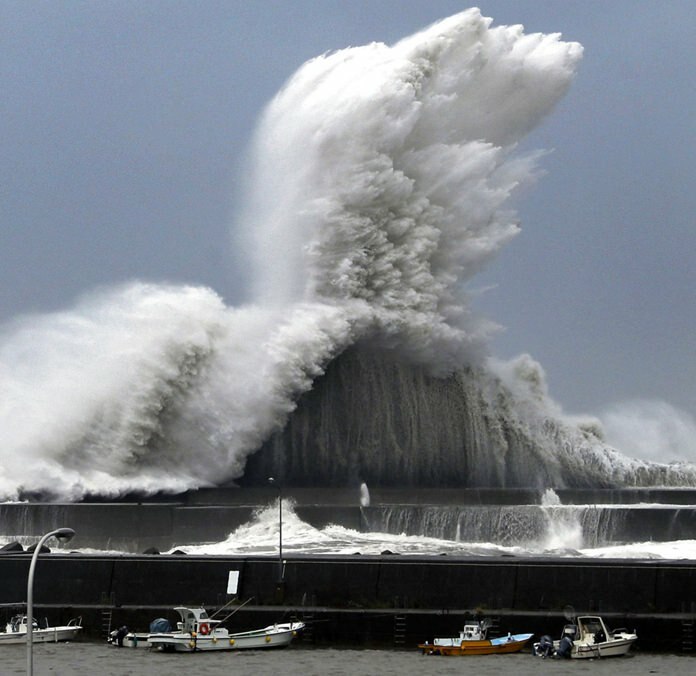 It was off the northern coast of Fukui on Tuesday evening with sustained winds of 126 kilometers per hour (78 miles per hour) and gusts up to 180 kph (110 mph), the Japan Meteorological Agency said. A man in his 70s died apparently after being blown to the ground from his apartment in Osaka prefecture, while a 71-year-old man died when a storage building collapsed on him, officials said. NHK public television said 126 people were injured. 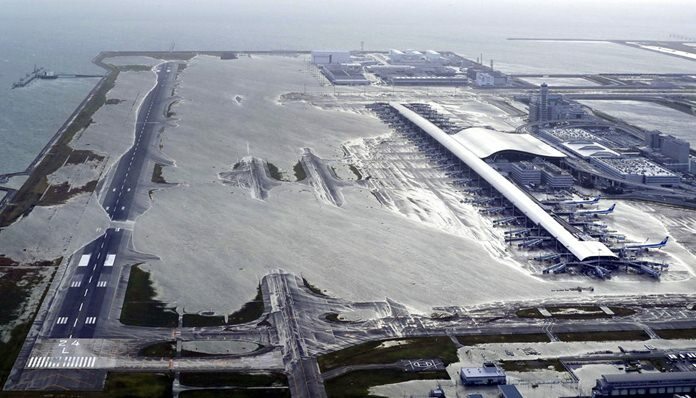 High seas poured into Kansai International Airport, built on artificial islands in Osaka Bay, flooding one of its two runways, cargo storage and other facilities, and forcing it to shut down, said the Ministry of Land, Infrastructure, Transport and Tourism. A passenger was slightly injured by shards from a window shattered by the storm. 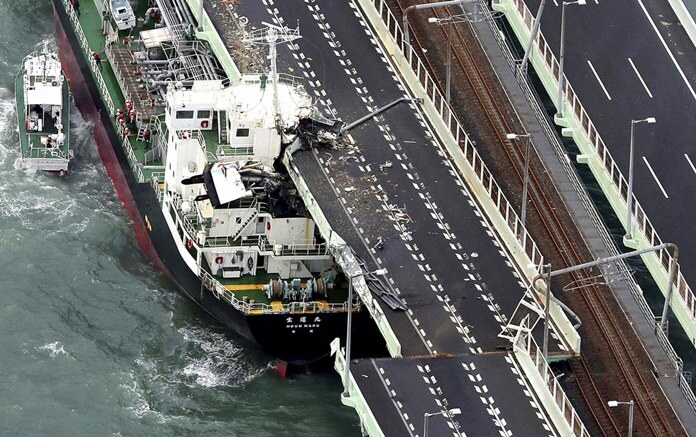 A 2,591-ton tanker that was mooring slammed into the side of a bridge connecting the airport to the mainland, damaging the bridge and making it unusable, leaving about 3,000 passengers stranded at the airport, transport ministry official Mitsuo Nakao said. The tanker was also damaged, but its 11 crewmembers were not injured and remained on board, according to the coast guard. More than 700 flights were canceled, according to Japanese media tallies. High-speed bullet train service was suspended from Tokyo west to Hiroshima, though service resumed partially later Tuesday when the typhoon left the region. 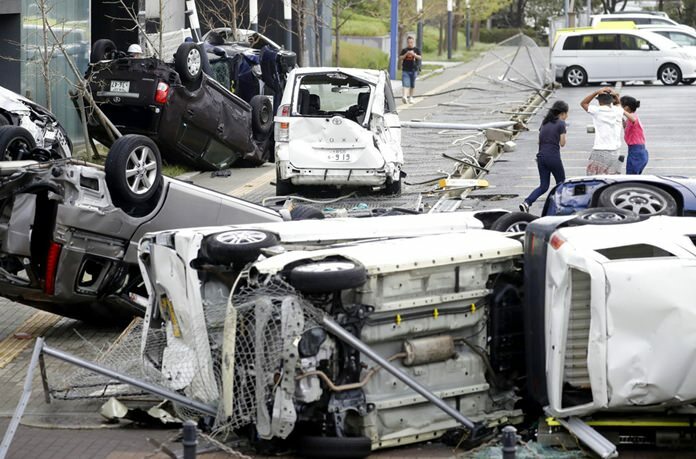 The storm also cut power to hundreds of thousands of homes and caused schools, shops and factories to close in Osaka, Japan’s second largest city and a business center. More than 1.6 million households remained without power in Osaka, Kyoto and four nearby prefectures late Tuesday, according to Kansai Electric Power Co. Elsewhere in Osaka, the Universal Studios Japan theme park and U.S. Consulate were both closed. Prime Minister Shinzo Abe canceled a scheduled trip to Kyushu, Japan’s southernmost main island, to oversee the government’s response to the typhoon, said Chief Cabinet Secretary Yoshihide Suga. In nearby Nishinomiya in Hyogo prefecture, about 100 cars at a seaside dealership were in flames after their electrical systems were shorted out by sea water, fire officials and news reports said. 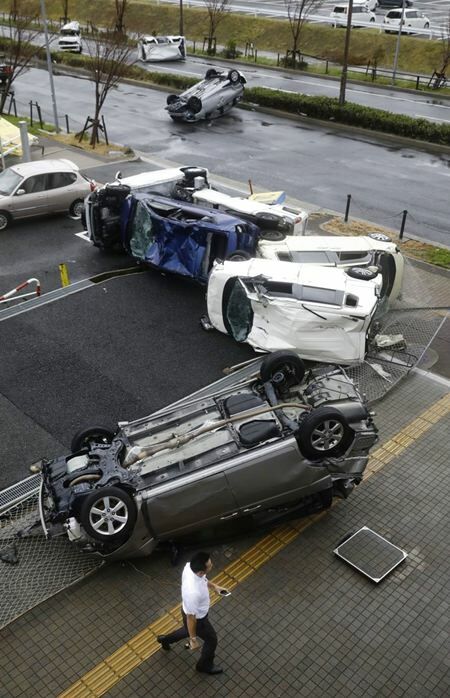 The typhoon first made landfall on Japan’s southwestern island of Shikoku and then again near Kobe on Honshu. Television footage showed sea water overflowing onto low-lying areas.